PORTO ALEGRE, Brazil (AP) Brazil’s Gremio has won the Recopa Sudamericana, beating Argentina’s Independiente 5-4 in a penalty shootout Wednesday night. The two-legged final ended 1-1 on aggregate, with no goals scored after 120 minutes in the second. 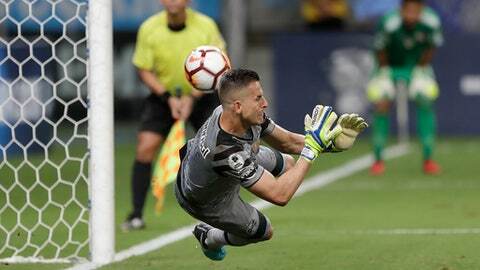 The winners of last year’s Copa Libertadores overcame the holders of Copa Sudamericana after goalkeeper Marcelo Grohe stopped the last penalty of the series, taken by Independiente’s striker Martin Benitez. The Recopa is played between the champions of South America’s two most important tournaments. Independiente played most of the match down to 10 players after defender Fernando Amorebieta was sent off after 38 minutes. The Brazilians made most of the pressure until the end of extra time, but failed to score. Gremio also won the Recopa in 1996.